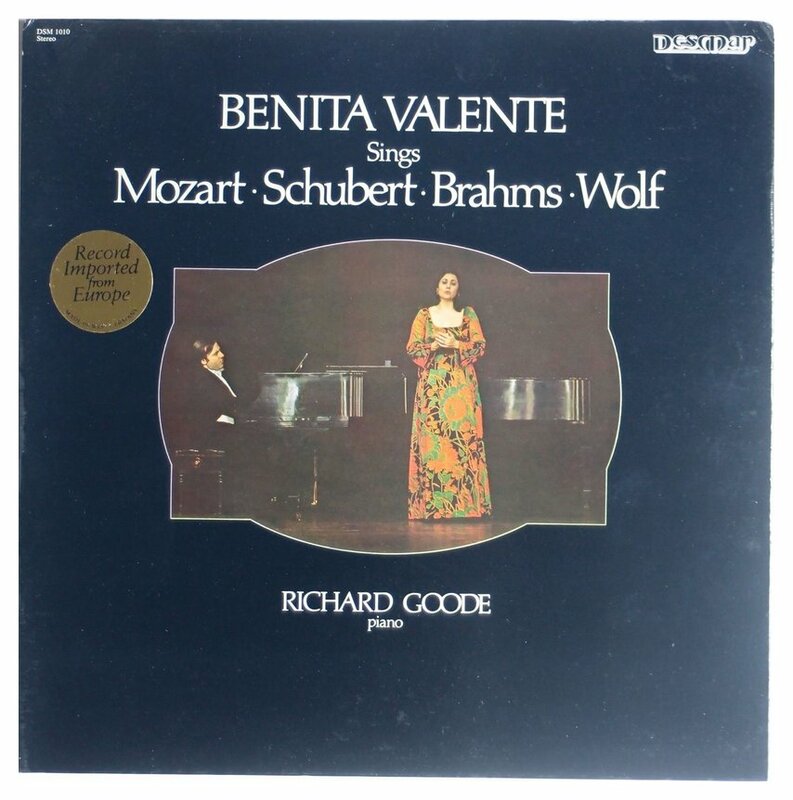 Benita Valente Interview with Bruce Duffie . . . . . . . . . The distinguished American soprano, Benita Valente, began serious musical training with Chester Hayden at Delano High School. At 16, she became a private pupil of Lotte Lehmann, and at 17 received a scholarship to continue her studies with Lehmann at the Music Academy of the West in Santa Barbara, where she got her initial professional music experience. 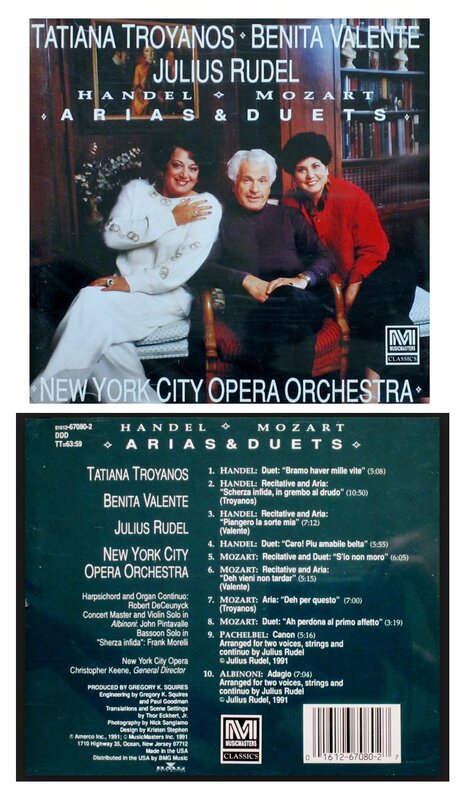 There she also met and collaborated with Marilyn Horne. In 1955 she won a scholarship to the Curtis Institute of Music in Philadelphia, where she studied with Martial Singher. Upon graduation in 1960, she made her formal debut in a Marlboro (Vermont) Festival concert. There she performed with Rudolf Serkin, Felix Galimir and Harold Wright. In October 1960 she made her New York concert debut at the New School for Social Research. After winning the Metropolitan Opera Auditions in 1960, she pursued further studies with Margaret Harshaw. 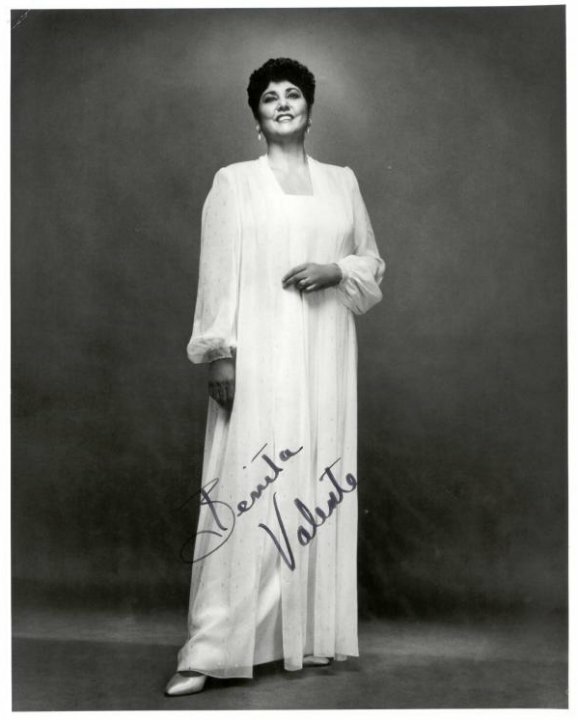 She then sang with the Freiburg im Breisgau Opera, making her debut there as Parnina in Die Zauberflöte in 1962. 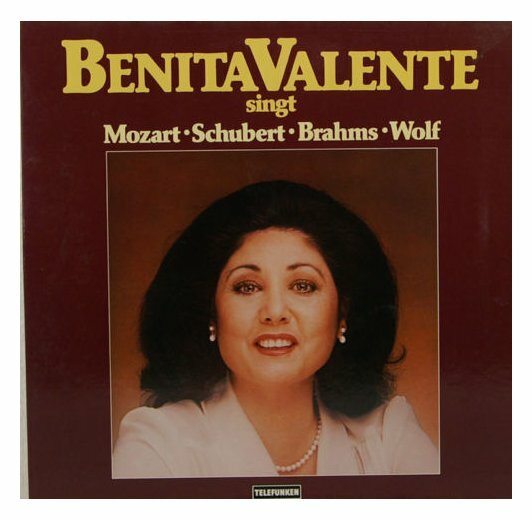 After appearances with the Nuremberg Opera in 1966, she returned to the USA and established herself as a versatile recitalist, soloist with orchestra, and opera singer. Her interpretation of Pamina was especially well received, and it was in that role that she made her Metropolitan Opera debut in New York in September 1973. Her roles at the Metropolitan Opera have included also Gilda, Nanetta, Susanna, Ilia, and Almirena. Other roles include Euridice at Santa Fe, the Countess in Le Nozze di Figaro in Washington, and Dalilah in Florence. Festival appearances include Tanglewood, Aspen, Ravinia, Grand Tetons, Santa Fe, Vienna, Edinburgh, and Lyon. 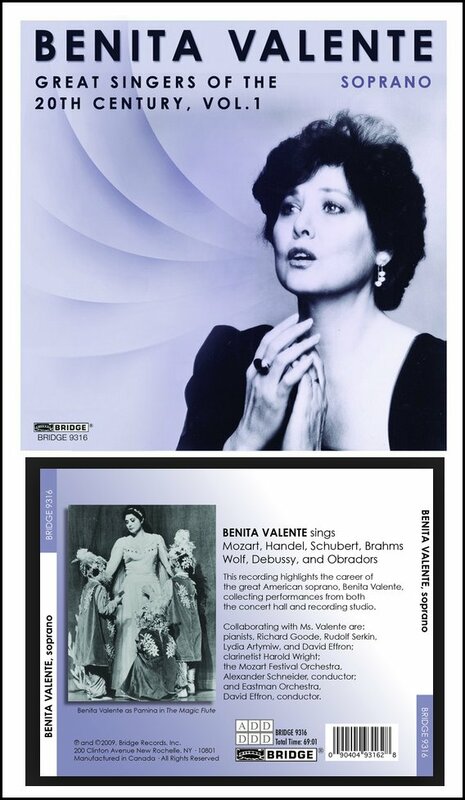 Benita Valente has been an internationally celebrated interpreter of Lieder, chamber music, oratorio, and opera. Her keen musicianship encompasses an astounding array of styles, from the Baroque of J.S. Bach and George Frideric Handel to the varied idioms of today's leading composers. She won praise for her performances in operas by Monteverdi, G.F. Handel, Verdi, Puccini, and Benjamin Britten. Her extensive recital and concert repertoire ranges from Schubert to Alberto Ginastera. Especially noted for her collaborations with living composers, she has sung in many chamber music and recital performances, often in world premieres. As the soprano in residence at the prestigious Marlboro Festival her performances and recordings with the legendary pianist Rudolf Serkin won great acclaim. 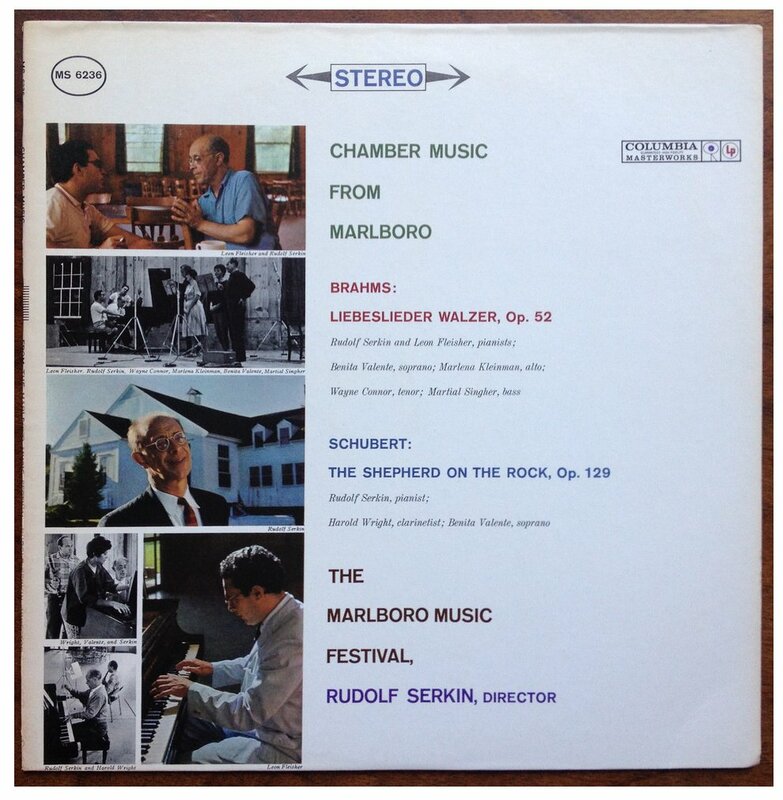 Other major chamber music collaborators have included the Guarneri and Juilliard and Orion String Quartets, cellist Yo-Yo Ma, clarinetist Richard Stoltzman, guitarist Sharon Isbin and pianists Peter Serkin, Emanuel Ax, Leon Fleisher, Richard Goode, Malcolm Bilson and Cynthia Raim. 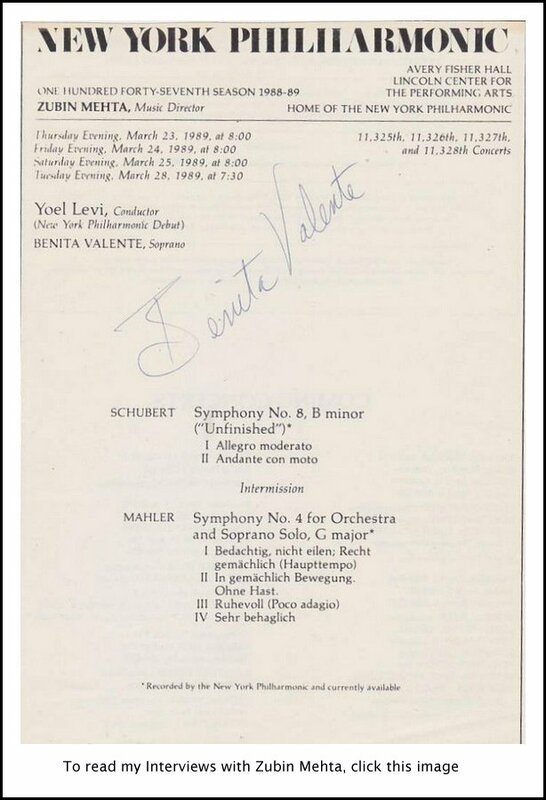 Benita Valente has been orchestral soloist with virtually every important conductor and orchestra in the world. She has sung under the batons of Claudio Abbado, Daniel Barenboim, Mario Bernardi, Leonard Bernstein, Sergiu Comissiona, James Conlon, Edo de Waart, Christoph Eschenbach, Nikolaus Harnoncourt, Rafael Kubelík, Erich Leinsdorf, Raymond Leppard, James Levine, Kurt Masur, Riccardo Muti, Seiji Ozawa, Robert Shaw, Leonard Slatkin and Klaus Tennstedt, and with every major symphony in the USA, Canada and Europe. Valente has been recorded by seventeen recording companies. 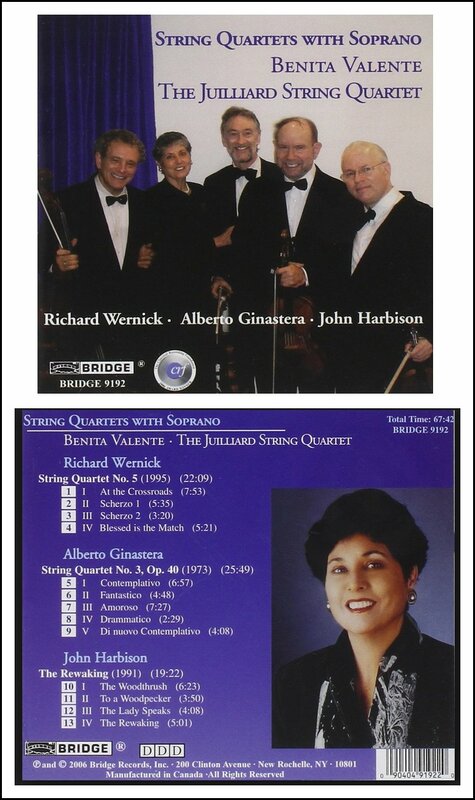 She received a Grammy Award for her recording of Arnold Schoenberg's Quartet No.2 and a Grammy nomination for her recording of Haydn's Seven Last Words of Christ, both performed with The Juilliard String Quartet. Her recent recordings include music of Ralph Vaughan Williams, Debussy, and Bolcom. Valente was the 1999 Recipient of Chamber Music America's Highest Award: The Richard J. Bogomolny National Service Award, the first vocalist to receive the award in its twenty-year history. The article then went on to describe the details of her joint recital with Richard Goode. All I can add is that I had admired her on recordings for a long time, and was delighted when she made appearances in Chicago. One such visit was in May of 1987. We arranged to meet and had a delightful conversation about many musical ideas. Here is what was said that afternoon . . . . . . .
Bruce Duffie: Tell me the particular joys and sorrows of singing contemporary music. 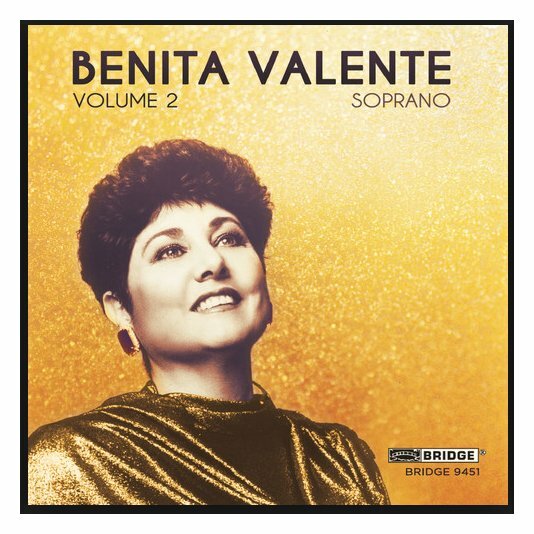 Benita Valente: [Laughs] There are joys and sorrows. The reason why we do it in the first place is in hopes that there are joys, and once you get into it and see how much work there is to do and how difficult it is to put it together, that’s when the sorrow begins. It takes so many hours. BD: Do the joys compensate for the sorrows? Valente: When all of that is past, then the joys come back again, and yes, when it’s over with, you feel that it was a wonderful piece and I’m glad I did it. I think I’ll feel that way about the Shostakovich, too. It is a beautiful piece. BD: Are most of the new pieces that you do, especially world premieres, worth all of the work? Valente: I’ve tried not to get involved with the ones that I felt were not going to give me some satisfaction, and I must say most of the ones that I have done have been very satisfying. 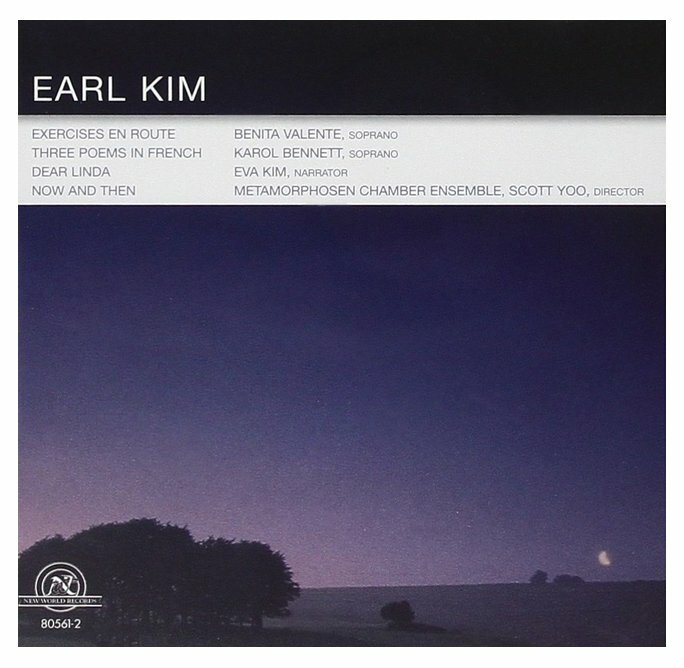 The last one I did was by Earl Kim, a piece for soprano, string orchestra and harp called “Where Grief Slumbers.” We did that in Cincinnati last season and it’s a wonderful piece. BD: What do you look for in deciding whether or not you will do the piece that’s been requested? Valente: I know Earl and I know his writing, so I knew that whatever he wrote I would love. It’s always very lyrical — not in the sense that maybe you would say it is lyrical, but that I feel from my soul it is lyrical. The words go with the music, and you can’t sing a wrong note because it shows immediately. When you learn what the right notes are, nothing will do except the right notes. That’s the way his music is — very appealing. BD: Do you use a completely different technique for new music than you do when you sing Mozart? Valente: No, I don’t. I try to apply all the same techniques to the new music as I would to Mozart. If you’re talking about vocal technique, the stretches are maybe bigger than what you’d have in Mozart — although he has some big stretches such as octaves plus. But when I’m learning contemporary music I break down the notes. I bring the ones that are high into the middle register, the ones that are low into the middle register and make my melody up from that. I think in octaves away from the central pitches, so that when I go back to Mozart, my voice wants to continue to think in octaves and you’re all over the map. So then you have to tone down your brain so your brain then gets the stimulation. BD: What do you expect of the audience that comes to hear a brand new piece? Valente: I know it’s difficult to hear something for the first time. I always am happy when there is someone interested enough to write good program notes or to give lectures. People will come very often ahead of time to hear a short lecture on the piece before hearing it, and then stay to hear it another time if it’s being done more than once, just to get to know it. BD: Do you think that the audience for new pieces is growing? Valente: I can’t tell because I don’t do enough new pieces, but it’s always a sticky situation. It’s always harder to apply yourself when it would be a lot easier to go and hear the standard repertoire and just sit and enjoy it because it’s something you’ve heard before. BD: How do we entice more people to get out of the standard repertoire rut? Valente: We just keep playing the pieces for them, I suppose. I have to do it, and I do it willingly. I have a lot of friends who are non-singers but who do want to give work to the young composers and allow them to create and bring us new ideas. When I’m in the Cincinnati community with The LaSalle Quartet, they do a new piece and take it to homes of their friends. They all sit, like at a roundtable, and just talk about the piece and have question-and-answer. They also lecture on the piece and play it one or two times and spread it out. People get to know it, and then when they go to do it in the regular hall on the regular series they have already a bit of an audience to come and hear it. They’ve talked to their friends to say what they feel about the piece. Not every piece is beautiful. BD: Should music be beautiful? Valente: I find great beauty in some of the saddest music. This is just the way my personality and my soul works. If you give me a happy fast piece and you give me a slow sad piece, I usually go for the slow, sad piece. It takes all kinds; it takes a bit of everything to make music. Certainly you want to get a bit of everything in there, as in the two pieces that we’re doing tomorrow night (with the Vermeer Quartet), the Chanson Perpétuelle (Chausson), and the Shostakovich (Seven Romances on Poems of Alexander Blok). BD: Let me ask a big philosophical question. What is, and what should be the place of music in today’s society? Valente: It’s like even our clothing styles or our lifestyles. You don’t want to just sit in one place always. If you just listen to one kind of music you would be missing out. It’s like reading the newspaper and only reading the news you want to read and not what’s there, or reading a newspaper that doesn’t give you all the news. There are plenty of those. Then you are oblivious to everything else. So why not grow? Why not be stimulated? I love live concerts, and am not big on listening to tapes and records. I feel much more stimulated if I go to hear a live concert or see a live play... although I love movies. But there is something about being in the theater and being part of what’s happening on the stage that has an added facet that I like very much. BD: Do you enjoy the technical side of making records? Valente: That’s difficult. It’s very different from anything else we do. You have mics instead of a public, and you have to think far in advance to know that people will be listening to this, and if you make a mistake they’re going to hear that same mistake over and over and over; whereas if you make a mistake in a concert, they’ve only heard it that one time. It’s not cloying, and it doesn’t get on your nerves, and maybe somebody’s missed it or it just fits in with everything else you’re doing. It’s not all that bad if I forget a word or something, but if it’s on a record it’s there forever, and every time you listen to it you pass that place that’s blurred, and no one wants that... certainly I don’t. BD: Is there no compensation for the fact it can be cut and re-done? Valente: I don’t like to have things cut too much. I like to sing the songs straight through and get the pacing and the feeling of it. I feel that when it gets spliced up too many times it loses something. Each splice takes something away from it. I’m happy to say most of the things I’ve done have had very little splicing done on them. BD: Do you think that music works well on records once it’s out there for the public? Valente: The first time I did Mahler’s Second Symphony I thought I had better listen to the piece beforehand. What did one do before records? You just learned it without all that and hoped for the best. You’re the one that forged the way that it was going to go. I was so affected by this piece that I wept buckets. So I thought I have to listen to this piece over and over and over until I get this out of my system. I won’t be able to stand on the stage and hear this piece and not cry. That’s how it affected me. So I was grateful to have a recording to listen to. BD: Then how is it different putting together a brand new piece where there is no recording? Valente: If it’s a brand new piece and you’re the one that’s doing it for the first time, everybody, whomever is working with you is at the same place. They can’t compare it to anything because it hasn’t been done before. So that has a challenge all of its own. BD: Do you feel too much is expected out of new pieces now? BD: Are we looking for a masterpiece every time out? Valente: I think so. But didn’t we always? [Laughs] I think all composers have been criticized. Valente: I don’t know. You tell me. Where do you think it’s going? I hear people talk, that opera’s in trouble and then you read in the back of Opera News that comes out from the Metropolitan Opera how many companies are performing, and what they are doing, and it keeps enlarging. I hear people say there’s no audience for Lieder recitals anymore, and yet I have not felt troubled by not having enough Lieder recitals. I certainly have enough to do, in fact more than I want to do at this point. So I don’t really know. Some cities I go to are so rich with the arts and some of them are absolutely barren. What is it that makes this? I don’t know. I can’t answer it. BD: Should we try to balance it out a little bit, or should we simply enrich the rich cities and not worry about the barren ones? Valente: I keep thinking this. My husband is a bassoonist, and when he first went to audition for the Baltimore Symphony he was one of four people going to audition. Now if you go to one of those auditions as a bassoonist, you may be one of four hundred people! So I figure the more of us that there are performing, the more places we’ll have to create to perform. Philadelphia, for instance, doesn’t have a small enough hall, a one thousand seat hall to do Lieder concerts and chamber music. We have a problem trying to find a place to do something like this, a place that has decent acoustics. Philadelphia is too close to New York City. New York has all of these places, so people say they’ll simply go there to hear it. That’s a shame. They should be a little broad minded. BD: And more chauvinistic to have more things in their own home town, whatever home town it is. BD: How do you divide your career between operas and concerts and Lieder recitals? Valente: I try to do all of my Lieder recitals in one period of time because I can’t jump from Lieder recitals to opera. When I’m doing a Lieder recital, I want to do just that and not have my attention divided by having other kinds of repertoire to work. First of all, it takes a lot of time and work to find the kind of program you want to do. You have to sort it out, decide what songs you want to do, rehearse it with your pianist, get it ready and perform it. It takes months. So I allow two or three months a season to do that, and then I perform this Lieder program over the next two months. BD: Always the same program? Valente: Yes, generally. Each year I’ll make a different program, and I will vary it slightly. I’ll throw in a different group. 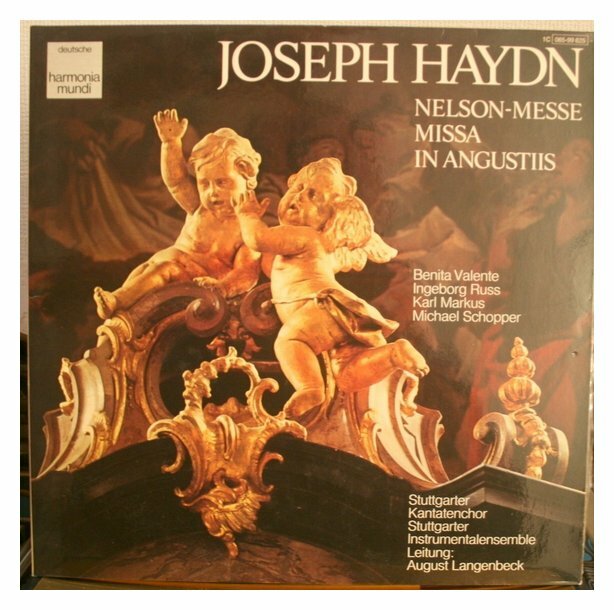 This year I did a Haydn group, then I decided to do a Mozart group. I did both because I have enough repertoire to do this, but when you’re first starting out, or even midway through your career, it’s difficult to get repertoire together. You need to find the beginning and the end of a program, making sure it is interesting to you as well as your audience, and not just doing an audience-pleasing kind of repertoire. I need to please myself in order to please my audience. BD: So you want the audience to be pleased, but as a by-product? Valente: Yes. I’m not going to push something down their throats necessarily, but I will put in some odd things. I’ve been one of the first, I suppose, to throw in the Strauss Ophelia Songs and the Wolf Keller-Lieder. I enjoy doing that. Once you get into these and you feel what wonderful pieces they are, you want everybody to feel that way about them. BD: Have you ever made a mistake about a song, one you think is terrible, and then a few years later you come back to it and find it is a wonderful song? Valente: No, not as extreme as that, but I have started songs where I’ve felt ambivalent, and then grew to really love it. I found that with the Missa Solemnis of Beethoven. I suppose this might have been partly because everyone told me it was a great piece, a wonderful piece, and I got into it and wondered what all the fuss was about. Then it began to hit me after I’d performed it a couple of times, and oh my! Valente: They were right, exactly! BD: I asked you about how you divide your career. Is it more opera or more Lieder? Valente: With opera it depends on where you’re asked to go. Some years are heavier in opera than others, and that always takes up a great bulk of time. I’ll be in Santa Fe doing Ariodante this summer. I’ve been working on this score for a couple of months already, and now I have to finish up memorizing it and go to Santa Fe and have three or four weeks of rehearsal. Then I will be there for two months to do performances. So, you see what kind of time opera does take out of your schedule, and if you have a family, you have to decide how much you want to give up, how many weeks you want to be separated. You have to work out the schedules. With chamber music, I know a lot of that repertoire and if someone asks me — as was done last week — to go to Dallas to do a Beethoven 9th Symphony, those kinds of things you just have in your repertoire, and you can go out and do them between the other things that you’re learning. In fact, you take your music with you to continue work on the project you have going while you’re performing another piece that you know really, really well. BD: On the opera side, how do you decide which roles you will accept and which roles you will decline? Valente: I look at the score and decide if it’s in my range and if it’s in my range of personality. If there’s something about the character that I really don’t like, I don’t want to get into that. But the character and the music go hand in hand. I was recently asked to do Ellen Orford, and I decided that it was too heavy. It was too much in the low register, and I’m not that kind of singer. I wouldn’t be doing justice to the music and I would only feel totally frustrated. So, much to my reluctance, I had to turn it down. BD: Is it something you might pick up ten years from now? Valente: I don’t think so. My voice is not going to change in the direction that this piece would need. It’s pretty dramatic singing. There is one aria that is higher, and I could probably do very easily, but the rest of the role keeps sinking down into the lower register and is heavier. Valente: Yes, and that’s not my voice. I can’t do that to myself, to my voice. BD: When you are on stage in an opera, are you portraying a character, or do you really become that character? Valente: I feel like I’m in a ballet. First of all I’ll memorize the role, and then I’ll get with the stage director and everything will fall apart because moving and singing the role as you have known it up until then doesn’t work! So then you do the movement, and words start to come and you incorporate it. You have both things going at the same time so that with the movement you have the feeling for the word. So you feel like you’re dancing. You’re there in space. You’re moving your whole body and it’s absolutely wonderful. It’s not lonely because you have lots of friends there on the stage with you. You have a whole orchestra and a conductor to help you out. You have the prompter in the prompt box. It’s a wonderful feeling. I like having a lot of company. BD: You enjoy doing opera then? BD: More so than concerts? Valente: Yes, actually I have a better time. I consider it much more enjoyable. Doing the recital, as opposed to concerts, it’s very lonely. There’s just you and the pianist, and the whole bulk of the work is on you. It’s very intense. It’s very concentrated and you feel like you’re on a tightrope. You dare not take a false step because that thing you are trying to create would be diminished somehow. BD: Let me ask the Capriccio question then. In opera, where is the balance between the music and the drama? Valente: It’s all caught up in what everybody’s doing. You’re helped out by what the scenery is like, what your costume is like, what you feel like in your make-up and your wig, and where you are on the stage. All of these ingredients have to do with your feeling for what you’re portraying on the stage, so you have a say-so in what that is. But yet there is the whole picture that you’re looking at. You’re not just standing there in front of the piano with a certain amount of light and program notes in a repertoire because it suits your voice completely. BD: When you’re selecting roles, are there any where you don’t like the character but the music suits your voice so well that you find yourself singing it? Valente: I have the kind of voice that I usually don’t have that problem. It’s a light lyric, and so far they’ve all been likable characters. I guess Micaëla is not one of my favorite roles. I’ve always felt she was kind of a namby-pamby. I would have much rather played Carmen! BD: Besides Carmen, are there any other roles you would love to sing that are out of your reach? Valente: I would love to sing Wagnerian roles. I did do a Valkyrie a couple of times my first year in Germany. I was the first Valkyrie, Gerhilde, and that was so much fun, really. Then I was steeping myself, going out and sitting in the audience for the other acts, just steeping myself in that way of singing and movement. It takes getting used to. I remember sitting there thinking it’s going to go on all night long, and then being caught up in it and finding it’s like prehistoric people. They walk very slowly, they sing very slowly, and this mountainous music just keeps coming up at you and repeating over and over a little bit different each time until you’re absolutely overwhelmed. But then I think what it might be like to interpret a role like Sieglinde or one of those Wagnerian roles which I will never be able to do. BD: Are audiences different from country to country or even from city to city in the same country? Valente: Yes, they are. It depends on their education, too. We were talking about a place like Cincinnati. I go there a couple times every year, and I feel the audience is educated. They have been doing music, they’ve been having music in their city for many years, and they have a tradition. When you go to Germany, that’s what you feel — the tradition. And the size of the halls is important. They haven’t built the halls large enough to hold thousands of people because of the money. They built them because of the art, because of certain needs of the composers, and certain kind of space. You don’t want to be too far away from those halls, and the public is just so educated. They are willing to listen to anything. We did one contemporary opera a season, and everybody in town would be talking about how they hated it or loved it or whatever. But at least they were talking about it, and if they met you on the street, they would speak to you and say how wonderful it is that you’re and opera singer, that you’re in their country to sing, and how much they appreciated us and that our work was totally accepted. Whereas if you’re a singer in the United States, there are still those thousands of people who think you just stand on the stage and sing. It’s slowly changing, but it’s taking a while. They don’t understand there’s work involved. It may be something that you love very much and wouldn’t want to trade anything for. Nonetheless, there’s a lot of work and knowledge that goes into it, but they don’t realize that. It is partly that we were so busy settling our country that we have not caught up yet with the arts. BD: Should the concert producers and artists try to go after the public that goes to rock concerts and watches MTV? Valente: My son likes rock concerts and he likes classical music, and I don’t see why we can’t appreciate a cross-section of music. I certainly do. We don’t have to stick to one or the other. You don’t have to draw up sides. BD: Let me ask another balance question. Where’s the balance between art and entertainment? Valente: I have a lot of friends who say that what we do is entertainment, although I don’t feel that way about it. That is just my gut reaction. I feel like it may have an element of entertainment, but it’s more of something that needs to be. I’m not there to make people particularly happy. I’m there to make them have feelings of all kinds, especially if I’m doing Lieder recitals. It’s not just one sided. It’s not like going to a musical. I haven’t been to enough musicals, so maybe they draw you through the gamut of feelings too. But to me they don’t have the depth. I’ve never been able to do light opera or popular music, although I might like listening to some of it. I haven’t been able to do it because it’s not the kind of music that sticks with me. After a while you’re so used to it that there’s nothing there anymore. It’s like having something disintegrate underneath you, whereas great music it continues to grow. It’s ever changing. It doesn’t just stay the same. BD: It also allows for different interpretations. Valente: Yes, from everybody. And each time you do it, it’s never the same way twice. You’re reliving and recreating and creating all at the same time. It’s a wonderful feeling. BD: Let me broach the question of opera in translation. Do you approve of it? Valente: It depends. There have to be places that we go to hear it in the original language. I also feel that a translation has to be carefully done. I don’t think there are enough of those. Yet, I feel the audience should know what the words truly are, not just to read the translation but to hear what the words are, and that the hall should be small enough so that you can understand the words. Our halls are too big and you can’t understand them, or the balance between orchestra and singer is not enough so that you can understand the words. It isn’t always just a matter of diction, it’s a matter of vocal production and resonance and acoustics to get the word to the people. BD: Do you work harder at your diction when you’re singing in the language the audience will know? Valente: No, I don’t. I work hard at it all the time [laughs], but working on diction is working vocally and technically. You can’t work on diction without the other two because you can speak as loudly as you want in a certain kind of acoustic and it doesn’t carry. It has to be sung and projected in order to carry the word. BD: What about this new gimmick of supertitles in the theater? BD: [With a gentle nudge] You mean to say that when you study a role you don’t study the rest of the opera too??? Valente: [Laughs] Yes, but not as closely as you study your own role, and until somebody’s on the stage with you doing the role opposite you, it’s not the same. BD: When you’re studying a role do you get involved in the life of the composer and his letters and writings and everything else? Valente: Yes, but it always goes past me too quickly. I have to spend so much time doing the role and doing everything for the role — learning it, the memorization, getting as much background into the character as I can, and so forth. You’re so involved with yourself, what you’re going to wear and where you’re going to be on the stage etc., that you think you’ll get around to the composer and as much as you can read about him, but... Then when you get around to the next piece and you have the same problem again, you never quite catch up with everybody. BD: What about television? Do you think opera works well on the tube? Valente: I’ve seen it sometimes and it does work very well. I don’t think that the standard repertoire should be rearranged for television. If there is an opera written for television and the composer wants certain shots, that’s one thing, but when I’m listening to an opera and I hear this one singer but if I want to look to see what the other singer is doing, to see what his reaction is, if the camera’s limiting me to just the person who’s singing I get very frustrated. So it has to be carefully done. I like to see the whole stage to see what’s happening. BD: But you’re more of a creative artist. Valente: If you’re listening to a play, don’t you want to see how the other person is reacting? You’re not always with your eyes on the person who’s doing the talking. BD: Yes, but you’re an experienced woman of the theater, so you’re used to it and you expect different things than the average Joe. Valente: Well, shouldn’t they be also taught what’s going on? Shouldn’t they see? Yes, it’s important that they choose for themselves. It shouldn’t be chosen for them because that’s what happens with the shots. They’re chosen for you. You look at this person not the other one. I don’t want someone to make those decisions for me. BD: What advice do you have for a young musician who wants to write a new opera? Valente: I don’t know what advice to give. You either have the gift or you don’t and keep plodding along. What advice I do have for young musicians, or young singers, is that they have to have a tremendous amount of patience and don’t leave any stone unturned because a lot of it is experimental. You don’t know how it’s going to work. You don’t know how your voice works. You don’t know how your instrument works. We singers usually don’t start as young as the instrumentalists, and it takes us a while to catch up. It’s not just ingrained. It’s something we want to do and we go through all the frustrations. When you hit your late teens you finally start taking voice lessons, and you get to 25 and people are saying you’re too old already, which is all silly. Singers themselves say we’re too old when we’re 25, so just have a lot of patience and keep working. Be expressive. Enjoy it. It only goes by once. BD: What is the role you’ve sung the most on stage? Valente: I suppose Pamina in the Magic Flute [seen in photo at right-below]. BD: Do you like her? Valente: Very much, yes I do. I like her. I know her through her music, and it’s beautiful. BD: Is the same true with the other Mozart roles you sing? Valente: The Countess and I did a lot of Suzannas, yes. BD: What’s the secret of singing Mozart? Valente: Is there a secret to singing Mozart? I don’t know what it is. [Laughs] There must be a secret. I remember being told something by Lotte Lehmann’s brother, Fritz, who was a terrific coach. He said to me, “Sing Mozart, my dear. They will love you.” I wondered then and I still wonder what he means by that. All I know is that I love singing Mozart, and when people hear me do Mozart they seem to think the two of us go together. What is that magic? I can’t explain it. BD: Are there other composers that approach Mozart’s greatness? Valente: I’ve been doing an awful lot of Handel lately and there is some greatness there. He was a genius, too. Because there isn’t as much vocal music from Beethoven I don’t have the same feeling from him. With Verdi, it’s just unending when you do one of those roles. There’s always something else to be done, something that comes to you while you’re working on it that shows you his greatness. BD: Do you do any French roles? Valente: I did Mélisande last year in a concert version with the Philadelphia Orchestra, and that is also a wonderful role. [The cast included Ryland Davies as Pelléas, Wolfgang Schoene as Golaud, Thomas Paul as Arkel and Diane Curry as Geneviève. 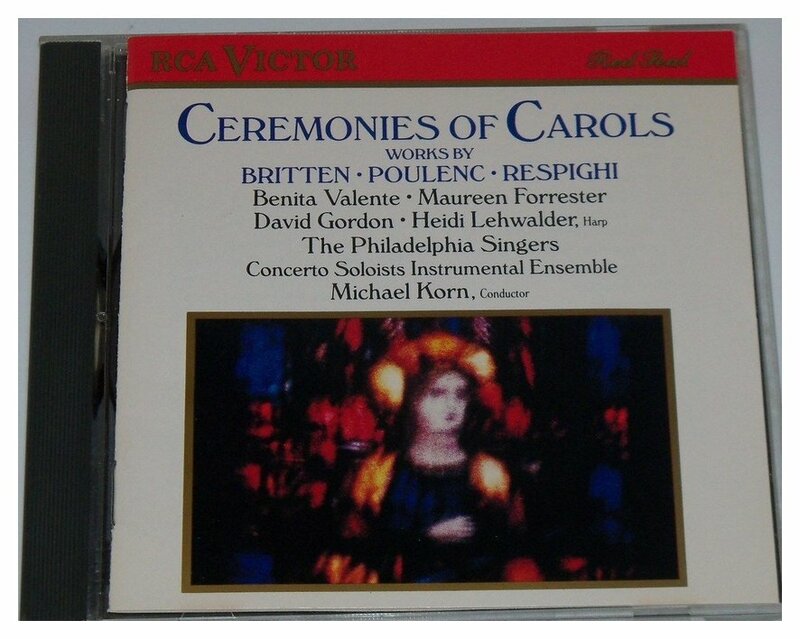 Dennis Russell Davies conducted.] That was an interesting experience because I had remembered seeing it at the Met a few seasons before and being absolutely dissolved in tears because it was so moving. Everything was so moving and beautiful, from the music, from the singers, from the stage, from the costumes, from everything. It was like a magic moment. I’ll never forget that performance, and yet half of the audience was gone by the end of that performance because too few of them had the knowledge or the desire to sit and listen to something they were unused to. When we did it in Philadelphia, I said to the conductor in one of our rehearsals, probably half of our audience will leave. He looked at me so shocked as if to say, “How could you say such a thing!” When the performances came, by the end of each one half of the audience would have been gone. Valente: It was hard to figure that out. Maybe it’s because it doesn’t have any great technical leaps or places where the audience wants you to stand on your head on the stage. There is nothing obvious, nothing you can see really clearly; you just sit and listen and work it out. You soak yourself in what’s happening like I soak myself in Wagner. You just sit quietly and let it wash over you and let it take you. They didn’t have the patience nor the desire nor the willingness to sit and have that happen to them, and for Philadelphia it was really shameful. BD: I remember many years ago here in Chicago we had both Wozzeck and Pelléas in the same season. BD: I love both works, and though I could understand why people would leave Wozzeck, I couldn’t understand why people would leave Pelléas. BD: Is there any hope for the public? Valente: If we’d half the size hall, more people might have stayed. We would’ve had to have more performances and a smaller audience each time, and they would’ve been more caught up in what was happening on the stage. But the Academy of Music seats three thousand or so, and I guess the people in the last reaches just didn’t feel like they were having anything to do with the stage. So they just left. I think that’s part of it. BD: Despite this, are you optimistic about the future of music? Valente: [Laughs] As optimistic as I’ve been about the past. It takes a long time for change, and we’re just one little speck of what’s happening in the spectrum of time. BD: Are you proud of your little niche in the spectrum? Valente: Very much. Very much. I’m very happy and proud. BD: You’ll be back in Chicago soon? Valente: I’m doing some Handel this summer, but I’ll be here again for the Beethoven 9th at Grant Park. BD: How much time do you allow to change between Handel and Beethoven, or between one extreme and another? Valente: There I’m not really changing. I’m taking a little snippet of time out from the Handel to do the Beethoven 9th and I’m slipping right back to the Handel. It’s like three or four days. We have two performances, and I come here two days before. BD: Are you careful, though, to allow yourself plenty of time in between big shifts? BD: Do you take time to rest and be with family? Valente: Yes. You have to. Valente: I do. Wandering has been very good for me, and I’ve loved visiting the various cities and getting to know people in different cities and different towns. It doesn’t even have to be cities, but it feels good when you get home, too. But then, if you’ve stayed home too long, if you have my kind of wanderlust it feels good to get out again. BD: Is your husband playing in an orchestra now? Valente: No. He manages the Marlboro Festival. He does that every summer during Santa Fe time. BD: I’m an old bassoon player myself, so I admire your taste in men. BD: Thank you so much for having me up this afternoon. 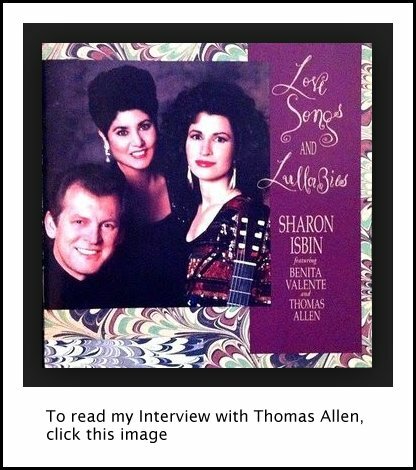 To read my Interview with Tatiana Troyanos, click HERE. To read my Interview with Julius Rudel, click HERE. To read my Interview with Maureen Forrester, click HERE. To read my Interview with David Gordon, click HERE. To read my Interview with Richard Wernick, click HERE. 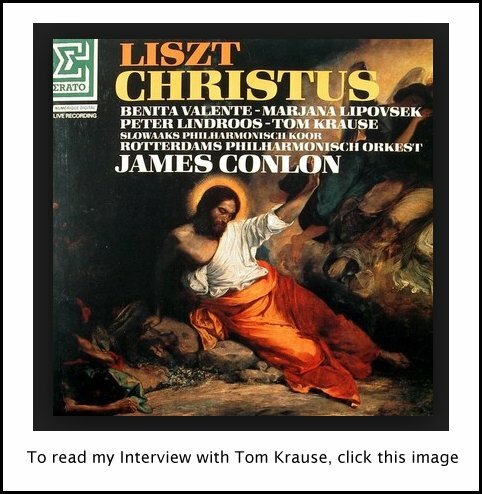 To read my Interview with John Harbison, click HERE. This conversation was recorded in Chicago on May 7, 1987. Portions were broadcast on WNIB 1989 and again in 1994 and 1999. This transcription was made in 2016, and posted on this website at that time.